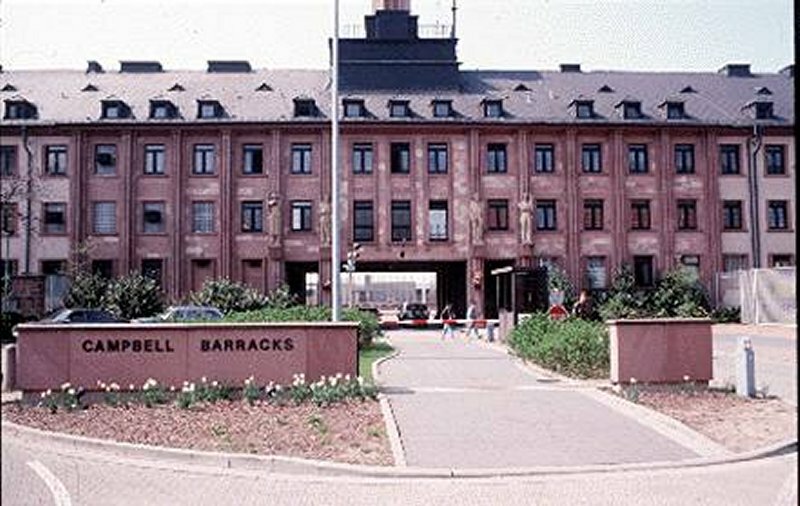 In the summer of 1994, V Corps headquarters moved from Frankfurt to Campbell Barracks, in Heidelberg. The caserne was formally renamed Campbell Barracks on 23 August 1948 in memory of Staff Sergeant Charles L. Campbell, 14th Infantry Regiment, 71st Infantry Division, who was awarded the Distinguished Service Cross posthumously for extraordinary heroism. On 28 March 1945, 2 days before the surrender of Heidelberg, Staff Sergeant Campbell led a patrol across the Rhine River near Mannheim and was killed while covering the withdrawal of his patrol as it returned to the west bank with valuable information. After World War I the Versailles Treaty of 1919 restricted the defeated German nation to a small self-defense force limited to not more than 100,000 personnel. The National Socialist regime came to power in January 1933 when Adolf Hitler became Chancellor. The new Government lost no time in taking steps to disregard what it perceived as unjustified terms of the 1919 treaty. In October 1933 Germany gave formal notice of its withdrawal from the League of Nations. In March 1935 compulsory military service was reinstated and a major buildup of the German armed forces began. As part of the buildup, the 110th Infantry Regiment was activated in May 1936 and scheduled for stationing in Heidelberg. The existing Grenadier-Kaserne (now Patton Barracks) was not large enough to accommodate the regiment. Accordingly, a new installation was built in 1937 on what was then farmland on the southern outskirts of Heidelberg near the suburb of Rohrbach. At first unnamed, the new installation was designated Großdeutschland-Kaserne after Austria became part of the German Empire in March 1938. Stories linking Großdeutschland-Kaserne to the Großdeutschland-Division of World War II have no foundation. The Kaserne predates the division, which was not formed until May 1942 when it was activated as an armored infantry (Panzer- Grenadier) division and later reorganized and redesignated an armored (Panzer) division. Neither the division nor any of its subordinate units were ever stationed in Heidelberg, nor was the 110th Infantry Regiment ever assigned or attached to the Großdeutschland-Division. When completed, the new Kaserne in Heidelberg became the home of the 110th infantry Regiment's headquarters, its 1st Battalion, and its two regimental support companies. The regiment's 2d Battalion was stationed at Loretto-Kaserne (Hammonds Barracks) in Seckenheim, and the 3d Battalion at Grenadier-Kaseme (Patton Barracks). At Großdeutschland-Kaserne the regimental staff occupied the north wing of what is now building 7; the 1st Battalion staff had the south wing. Buildings 3 and 5 were the Kantine with a dining facility, recreation room, and a snackbar where troops could buy food and drink when off duty. The upper floors of buildings 3 and 5 provided living quarters for the staff of these facilities, usually retired career soldiers and their families. The 1st, 2d, and 3d (rifle) Companies of the 1st Battalion were billeted in buildings 9, 13, and 8, respectively; the 4th (heavy weapons) Company in building 15; the 13th (cannon) Company in building 14; and the 14th (antitank) Company in building 12. Building 31-south provided stables for the horses of the 1st Battalion staff and the 4th (heavy weapons) Company, while building 3 1-north had stables for the regimental staff and the 13th (cannon) Company. Building 16 contained quarantine stalls for sick and injured horses. Arms rooms were in buildings 28 and 37. The regimental blacksmith was in building 25. The section of building 31 connecting buildings 31-south and 31-north was a riding hall. The parking lot in front of the building was a riding ring. Building 18 was a drill hall. The parade ground to the west of building 7 has been a parade ground since the caserne was built. The first American troops entered Heidelberg on the morning of Food Friday, 30 March 1945, the city surrendering without a fight. 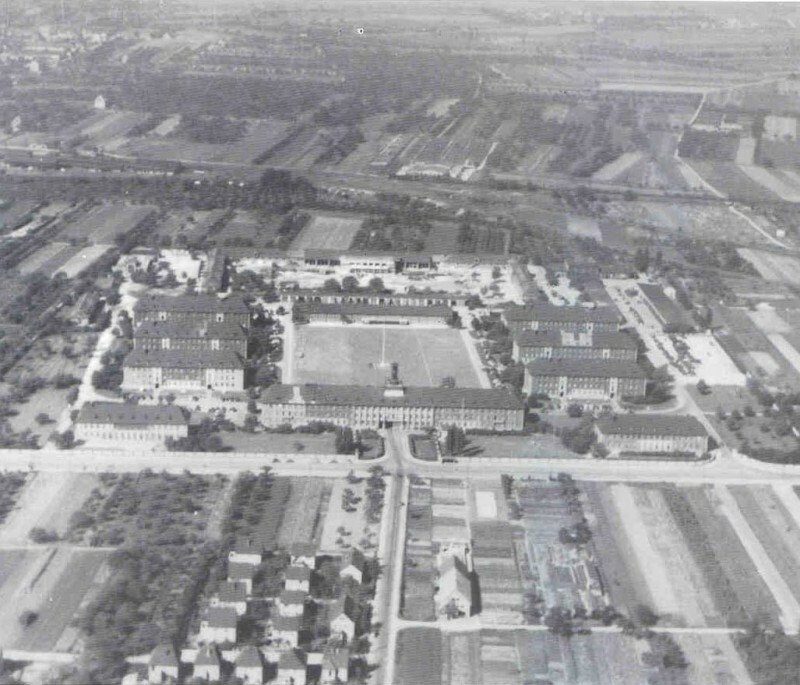 The U.S. units that initially occupied Großdeutschland-Kaserne (now Campbell Barracks) are not known, but by V-E Day8 May 1945the caserne was occupied by the headquarters of the U.S. 6th Army Group. The Army Group headquarters was inactivated in June 1945, whereupon the headquarters of the U.S. Seventh Army moved from Augsburg to Heidelberg, officially opening at Großdeutschland-Kaserne on 22 July 1945. The Seventh Army headquarters remained in Heidelberg until its inactivation on 31 March 1946. The headquarters of the U.S. Third Army then moved from Bad Tölz to Großdeutschland-Kaserne on 2 April 1946. In the meantime the Third Army had activated a new organization on 15 February 1946 called the U.S. Constabulary. The Constabulary was basically a police force with the mission of maintaining law and order in the U.S. Zone of what was then occupied Germany. A year later, on 15 February 1947, the Constabulary headquarters moved from Bamberg to Großdeutschland-Kaserne and the Third Army headquarters was inactivated on 15 March 1947. During this time the headquarters of the U.S. Army in Europe, then known as the U.S. Forces, European Theater (USFET), was stationed in Frankfurt in the IG Farben Building (the Abrams building). On 15 March 1947, the same day Third Army headquarters was inactivated, USFET was redesignated as the European Command (EUCOM), not to be confused with the joint United States European Command (USEUCOM) of today. 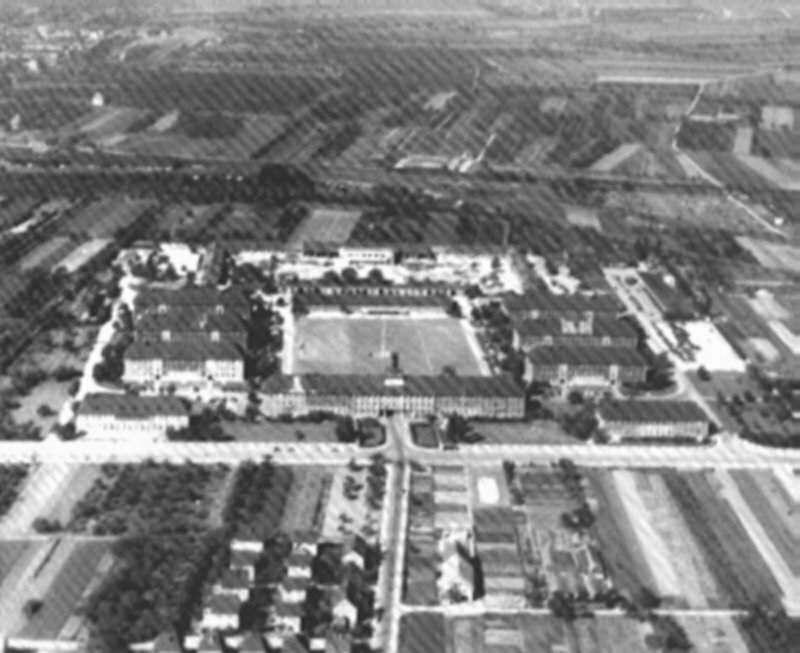 In the series of phased moves between February and June 1948, the Constabulary headquarters moved from Heidelberg to Stuttgart and the EUCOM headquarters moved into the vacated facilities at Großdeutschland-Kaserne. Until July 1949, the Commander in Chief, EUCOM, was also the US Military Governor of occupied Germany. His office and personal staff were in Berlin. The ranking officer in Heidelberg was the EUCOM Chief of Staff. While Lieutenant General Clarence R. Huebner was the EUCOM Chief of Staff, the riding hall in building 31 was converted to a casino, which opened on 4 March 1949. The next significant organizational change came on 1 August 1952 when a new joint headquarters, the United States European Command (USEUCOM), was activated in Frankfurt. At the same time, the EUCOM headquarters in Heidelberg was redesignated the United States Army, Europe (USAREUR). A small NATO planning cell called the CENTAG Plans Staff was also established at this time within the USAREUR headquarters staff, with the Commander in Chief, USAREUR, given the additional title of Commander, CENTAG (COMCENTAG). 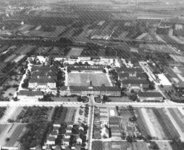 In April 1959 the CENTAG Plans Staff was designated Headquarters, CENTAG, and separated from the USAREUR headquarters staff. The USAREUR G3 (as the Deputy Chief of Staff, Operations, was then known) nevertheless continued to serve as the CENTAG Chief of Staff while serving as the USAREUR G3. The Supreme Allied Commander, Europe (SACEUR), formally activated a separated CENTAG headquarters on 1 October 1960. Between June and August 1961 the CENTAG headquarters staff moved from Campbell Barracks to Hammonds Barracks in Seckenheim. On 1 December 1966 the Seventh Army headquarters (which had been reactivated in Stuttgart in November 1950) merged with the USAREUR headquarters. This new headquarters was designated Headquarters, United States Army, Europe, and Seventh Army (HQ USAREUR/7A). In the late 1970s a series of studies concluded that interallied coordination would be improved by stationing three international NATO headquarters on the same installation with HQ USAREUR/7A. This resulted in the headquarters of the Fourth Allied Tactical Air Force (4ATAF) moving into building 8 of Campbell Barracks in September 1980. The CENTAG headquarters returned to Campbell Barracks in December 1980, occupying offices in buildings 3,5, and 7 (with an office for the CENTAG Chief of Staff in building 1). Finally, the headquarters of the Allied Command Europe Mobile Force (Land) moved to Campbell Barracks in December 1980, occupying part of building 7. In the late 1980s and early 1990s, the collapse of the Berlin Wall, the demise of the Soviet Union, and the dissolution of the East European Communist Block radically changed the politico-military situation in Europe. In addition to significant reductions and realignments of U.S. forces in Germany, a number of changes occurred in the NATO military organizational structure, all of which affected stationing at Campbell Barracks. On 30 June 1993, CENTAG and 4ATAF discontinued operations. On 1 July 1993, the headquarters of NATOs Allied Land Forces Central Europe (LANDCENT) became operational on Campbell Barracks with a staff from seven nations (Belgium, Canada, Denmark, Germany, The Netherlands, the United Kingdom, and the United States). LANDCENT moved into offices in buildings 3,7, and 8, formerly used by CENTAG and 4ATAF. The CENTAG Chief of Staff office suite in building 1 was returned to USAREUR.